In this sequel to The Bargain, Betsie Troyer is back home in her Amish community where she knows she belongs, free from the confusing Englisher way of life. She and Charley Yoder have made promises to each other, and her life is back on track--until Gerald Sullivan shows up with his young daughter, asking for Betsie's help. He’s on his way to find his estranged wife, and begs Betsie to take young Sheila in. When she agrees, Betsie's carefully planned life is shaken up again. Sheila's newfound faith is troubling to Charley--and his attraction to another girl is beginning to be a problem. But how can Betsie confront him when she is still trying to confront her own feelings about Sheila's brother, Michael? Keeping the peace between the Amish man she's always loved, a twelve-year-old Englisher girl, and a draft-dodging hippie is more than she ever thought she’d have to deal with in her simple, orderly life. Still, Betsie is convinced she can keep things from falling apart completely. Then during her best friend's wedding, tragedy strikes and her world is upended. She has to make a decision: does she love Charley or Michael . . . or is she craving a deeper love that only God can give? 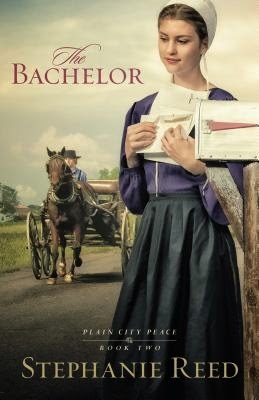 The compelling second novel of the Plain City Peace series, The Bachelor deftly weaves together the strands of a solid, simpler time with the turmoil of an era of change, revealing the strengths of both in its powerful narrative. I really enjoyed this book. The story moves at the perfect pace to keep you turning page after page after page. The characters are engaging and you can't help but love little Sheila especially. If I had one complaint it's that this is the second book in a series and while it works well as a standalone, there are many, many unanswered questions at the end so you or I will have to go get the next book to find out the answers. Personally, I'm going to be keeping my eyes open for it.